You may know that I have been attending College in Hemel over the past year or so, and have been learning many new skills and techniques. This past term was devoted to hand tailoring used in jacket and coat construction – just the sort of thing I have been keen to expand my knowledge of. I have been putting these skills into practice, and in the past couple of weeks I have applied this to a Tennant Coat I have been working on. I have used a very stiff, coarse canvas specially designed to use under collars. I cut it on the bias so it stretches and shape of the collar I am making, and cut it to the net size, without seam allowance (see below, left). 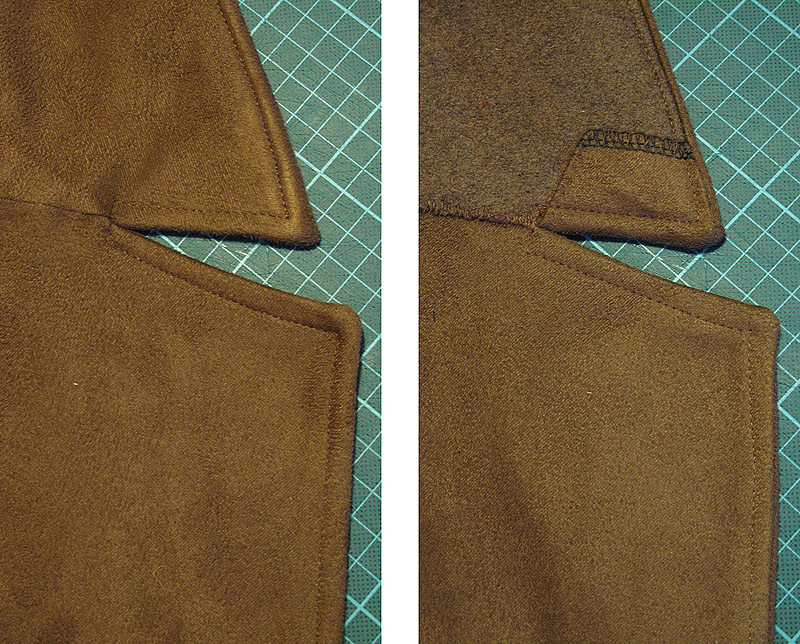 This is pad-stitched to a piece of thick felt that will form the under collar (see below, right). Notice how just sitting on my workbench, the collar already wants to keep its shape. The way it is sewn makes the fold sharp and resistant to falling flat. 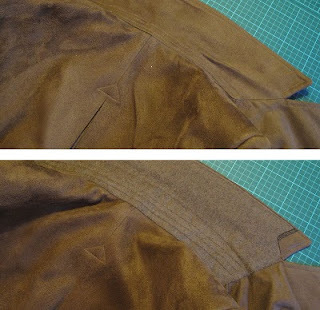 No amount of fusible interfacing can create this effect so efficiently. Once this is put in place in the coat, the upper collar drapes over this firm support and gives a much better finish and look. 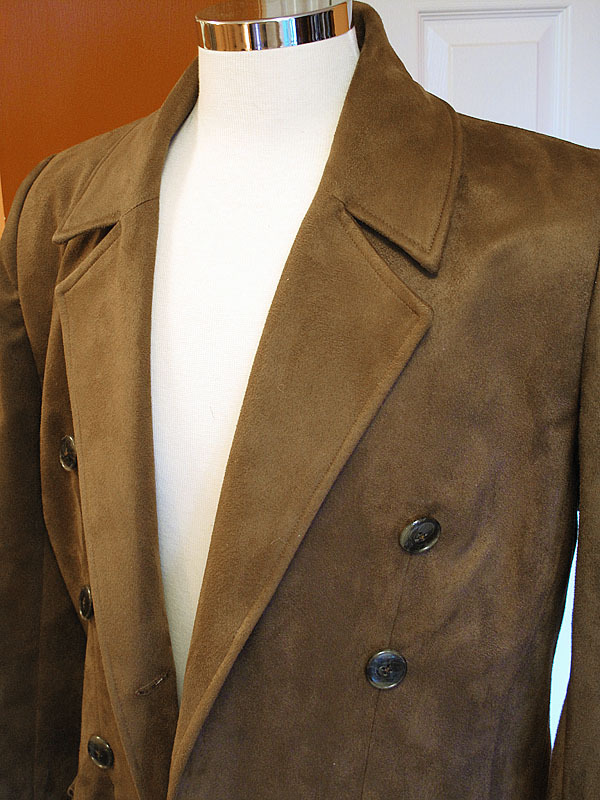 Below are some comparison pictures with an older design of coat I made previously. 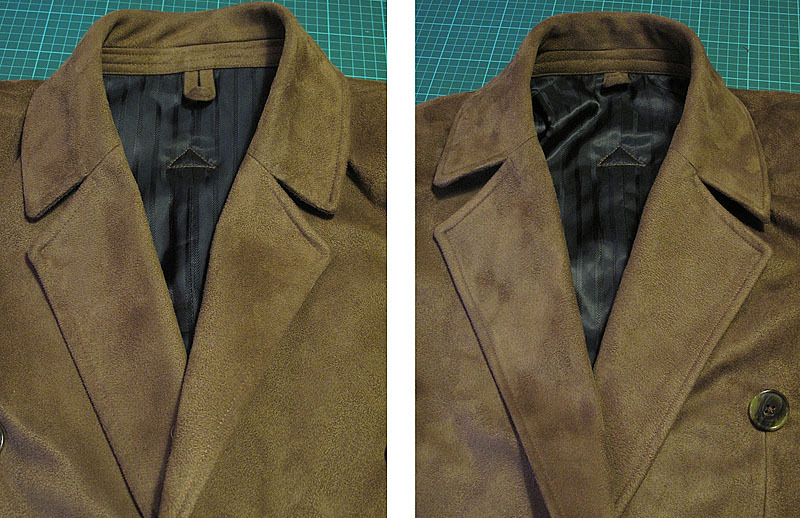 Here you can see the under collar area, and how the older collar (see left, top) sometimes creased, which was not desirable. Now it is so much firmer, giving good support to the collar (see left, bottom). You can see how this improves the shape around the back of the neck in the pictures below. 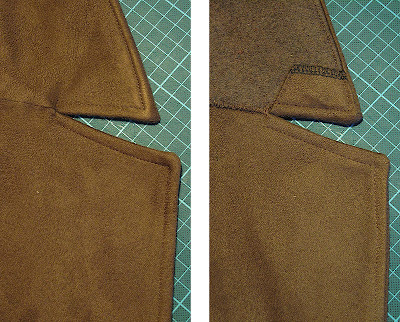 The hand-tailored collar (see below, right) stands a lot more upright, keeping its intended shape compared to the older design (see below, left) which sags. Finally, you can see the new collar looks very neat on the visible side (see below, left) as well as underneath (see below, right). I am very excited by how well this has come out, and will definitely be using this method again in future.